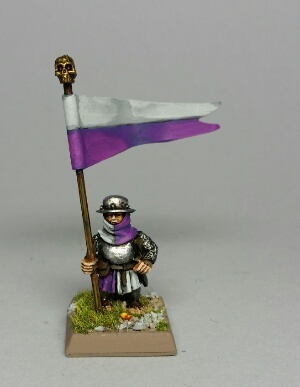 I finished the converted pennon/standard bearer for the crossbow unit. I would still like to add a badge to the banner, but have not made up my mind yet. I may plan that out for various units when I get further into the project. A group shot, including the above figure and champion, the first sample figure from Westfalia. He's painted in different colors, but I will let that slide as a matter of personal choice by the Captain of the Crossbow. Overall... great figures. Easy to paint & look great. Very happy with how they turned out, and regret that I didn't get more. 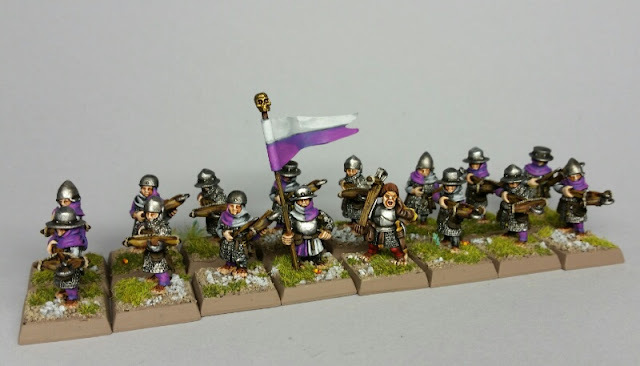 So at least one more unit this size is now on my wish list. I agree - they look fantastic! Nicely done. Perhaps a rabbit (hare) for these guys. I was going to try to do the Moot rooster on mine, but I'm not super confident in my freehand ability. There will be a few rabbits, but I'm trying to think of some individual unit badges (and names) too.